A funeral is a rite of passage for your loved one who has died. It is also the opportunity for family and friends to express their grief, to give thanks for all that their loved one has been in this life and to commend their spirit into God's keeping. If you are organising a funeral or a memorial service you may find it helpful to look at the information on the Church of England website. Other useful websites include Help to Understand Funeral Costs and a Guide to Choosing a Headstone. If you are wishing to bury your deceased loved one or their ashes in St Mary's Church graveyard, it is important that you know that the plot is 'graced' to your loved one for perpetuity. This is not the same as in a municipal cemetery where you buy the lease to the plot and the next of kin owns the rights. 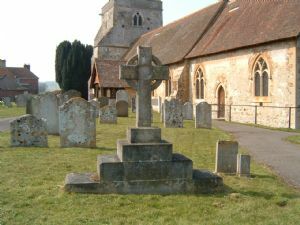 In the Church of England, Churchyard Regulations apply and there are certain stipulations that must be adhered to which are governed by Church Canon law. Therefore, any monument or additions to the graveyard need permission from the Vicar before they are put in place. For information and help organising a funeral at Frensham, please complete the form and send to the Reverend Jane Walker. Should you wish to hire St Mary's church hall for refreshments after the service please contact Barbara Potter on 01252 794727. A list of hymns that you might consider having at a Funeral or Memorial Service is shown below. The numbers refer to Hymns Ancient and Modern New Standard, which we use in St Mary’s.